Sometimes I think I’m a bit odd. Maybe just slightly kooky, a little nerdy, maybe even a bit eccentric. Then, every once in a while, I discover how truly normal I am. It’s almost disappointing, really. For example, I thought maybe getting so excited about spending time with the wonderful birds of SOAR that it evoked childhood memories of the night before Christmas might be unusual. 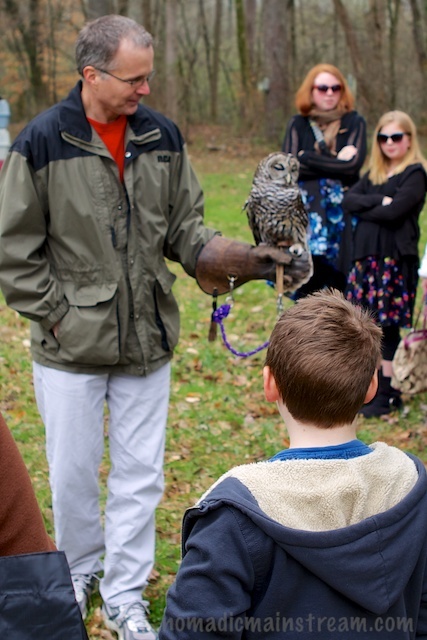 But what I’ve learned is that it’s not unusual at all to grin ear-to-ear when encountering wildlife up close. 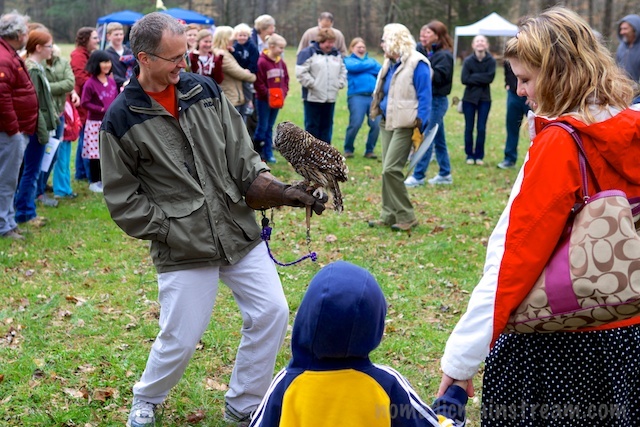 In fact, I believe every person I’ve seen attend any birds of prey program has responded with a similar grin. It really comes as no surprise that my brother and sister-in-law, joining us for the weekend, also exhibited the same jaw-cramping grin while helping out with an intimate show at the Little Owl Festival here in Chattanooga this weekend. The rain started early, turning into a light drizzle by the time we arrived at Audubon Acres for the festival. 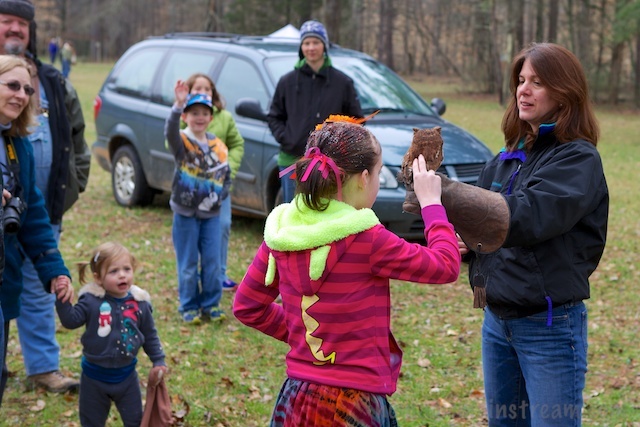 The organizers were fairly certain it was going to be dry for the duration of the festival. We were a bit nervous. But, we chose a back corner of the meadow, as far from the train tracks as possible, and started setting up. We waited to start the program until after the civil war re-enactor had fired his musket a few times. Thankfully, one of the event planners thought to warn us so we left the birds in their carriers until after the smoke from the gun shots had cleared. Once things had settled down, the small crowd that had braved the early weather headed our way and we got ready to start the show. We had a small enough group to have them in a circle around us, which allowed everyone to get a front-row view of each bird, with time to pause for photos. 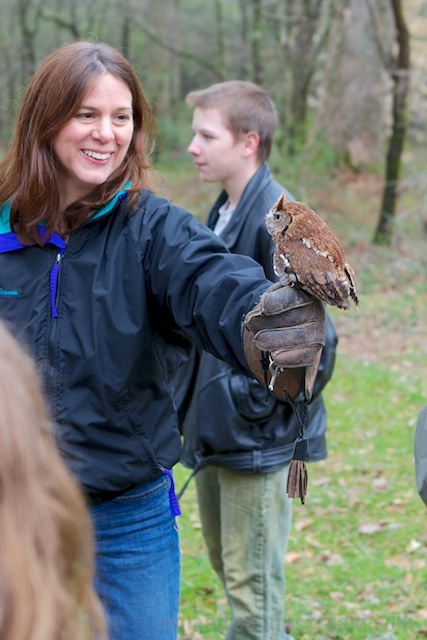 Megan was walking with Jerry, a Screech Owl, who was the only bird there that could be touched. 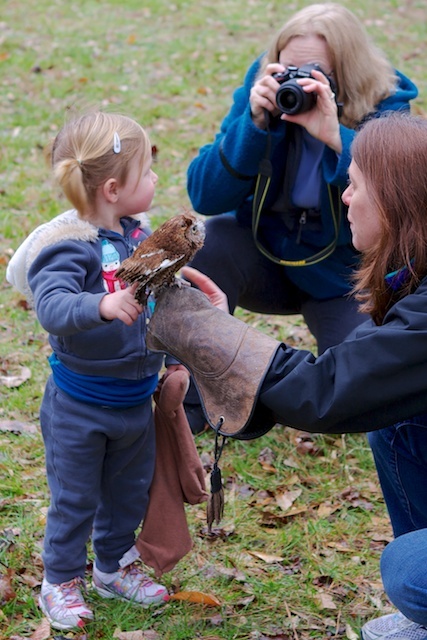 Megan got the added pleasure of seeing children’s faces as they touch an owl for the first time in their lives. It’s a look that makes me smile so hard, my TMJ issues kick in and cause stabbing pain in my face. It’s worth it. He said, “He was looking at me.” The angle makes it a little hard to tell, but my brother is still grinning ear-to-ear. I kind of get the feeling that if Artie could grin, he would be, too. By the way, I should mention that today’s photos are all by my favorite guest photographer, my husband. I put my camera on Automatic and handed it to him. Although I had to crop quite a bit because I should have put a longer lens on the camera, he did a fabulous job in a difficult shooting situation. 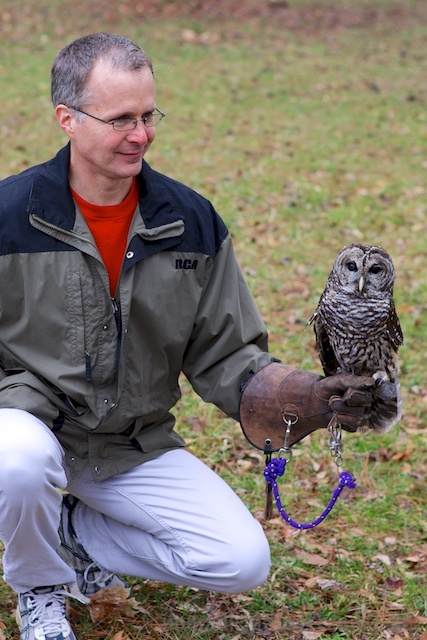 This entry was posted in Birding, Chattanooga, Family, Photography and tagged Barred Owl, Chattanooga Audubon, Little Owl Festival, Screech owl. Bookmark the permalink.